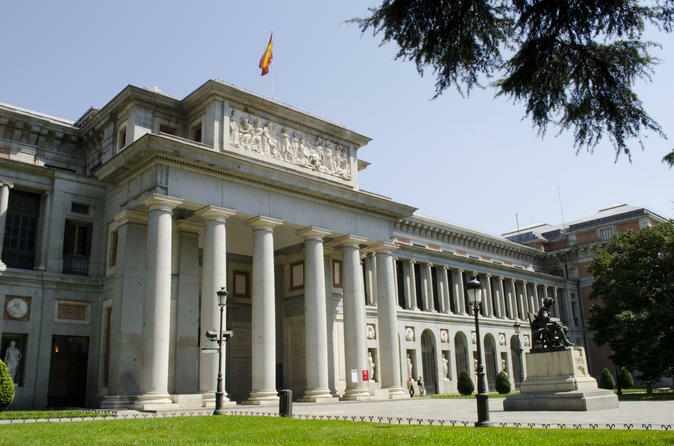 Enjoy a 2 1/2 hour sightseeing bus tour of Madrid and discover the most important buildings, avenues and squares, ending with a skip the line ticket to get inside to the world´s famous Museo del Prado where you can visit at your leisure. Discover Madrid on this 2.5-hour sightseeing tour, where you will see the most important buildings, avenues and squares. Get to know the main monuments and its history, from the old Habsburg and Bourbons quarters to the present modern city. See attractions such as the Gran Vía, Plaza de España, Moncloa, Calle Mayor, Puerta del Sol, Puerta de Alcalá, the bullring and Columbus square, Paseo de la Castellana, Plaza Castilla, fountain of Cibeles and the Real Madrid stadium Santiago Bernabéu. After the sightseeing bus tour, you will be dropped at the world´s famous Museo del Prado with your skip the line entrance to this outstanding monument.